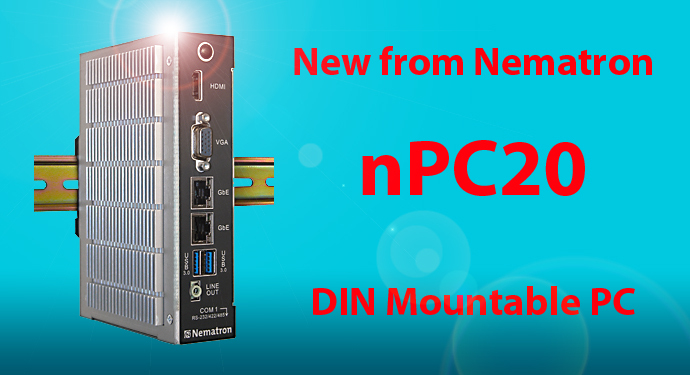 The nPC20 is a member of Nematron’s new Fan-less Node PC range featuring high-performance industrial computer system units for totally screen-less applications or requiring a separately mounted display. The completely fan-less, silent running nPC20 supports either the low power Intel Dual Core 1.46 GHz ATOM E3826 Processor or the quick 1.91 GHz Intel Quad Core ATOM E3845 CPU. An impressive level of I/O connectivity with 2 Ethernet ports, configured with 2GB of DRAM including options for 4GB or 8GB and equipped with an 80GB Solid State Drive as standard the nPC20 is certainly not short on memory options. The unit comes pre-installed with 32-bit Windows 7 with 64-bit as an option and is ACP® ThinManager enabled or supports a PXE-Boot configuration. Mechanically the all metal chassis offers DIN Rail or shelf mount brackets for improved mounting when using NEMA or IEC rated enclosures. Built for reliable operation in the most extreme conditions with a 0-55°C operating temperature and UL Class I, Div 2 certification (pending) the industrial grade nPC20 delivers the power to run a host of control applications, whether in process or manufacturing areas. For more information follow this link to our product page.